Cuyahoga Valley National Park is so different that it can’t be compared with those in western lands. Its emphasis is on being an urban park that concentrates on land reclamation rather than scenery. 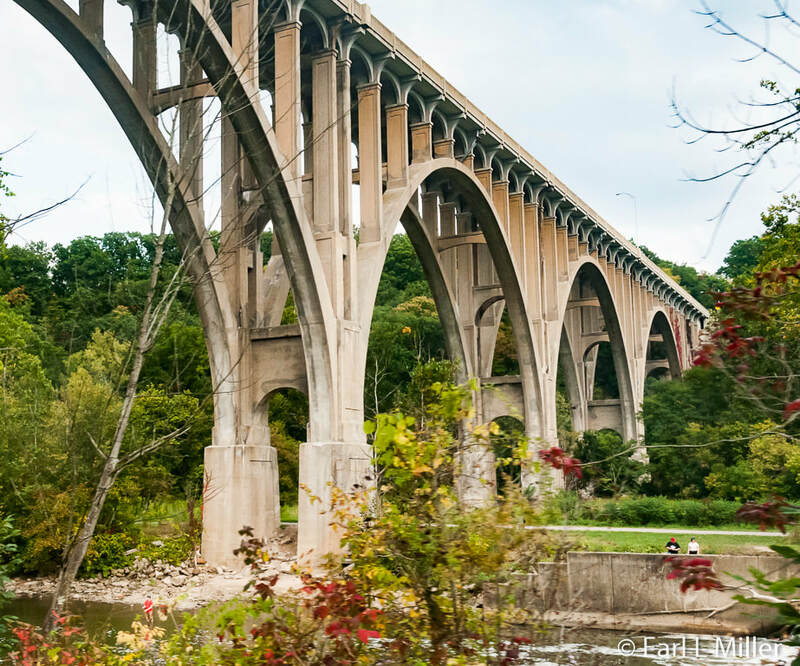 Major focuses are the Cuyahoga River that flows through the valley and the Ohio & Erie Canal. At around 2.4 million visitors a year, it’s the 11th most visited national park in the country. Within its 33,000 acres, visitors enjoy attractions existing prior to the park’s formation such as ski slopes, golf courses, theaters, a living history village, even a railroad. Small towns such as Peninsula dot its acreage. Entrances at its north and south ends don’t have toll booths since they are located within the Cleveland and Akron metropolitan areas. Area recreation, between 1825 and 1832, allowed people residing nearby to take carriage or boat rides along the canal. By the 1850's the railroad had come into the territory and people supplemented their train excursions by the Guide Book for the Tourist and Traveler Over the Valley Railway. The earliest park development came in the 1910s and 1920s when Cleveland and Akron developed park districts. Some of these are located within Cuyahoga Valley National Park’s borders. In 1925, the Olmsted brothers’ landscape architectural firm, known for New York City’s Central Park, prepared a study for these cities’ parks. During the 1930's, the Civilian Conservation Corps built many structures. This included the Happy Days Lodge, now used for special events, and the Virginia Kendall’s Octagon and Ledges shelters. Ski slopes, golf courses, and Blossom Music Center opened in succeeding decades. By the 1960s, local citizens in Akron and Cleveland feared that urban sprawl would overwhelm the Cuyahoga Valley’s peaceful beauty. They joined forces with such national forces as Congressmen Ralph Regula, from Navarre, and John Seiberling, from Akron, and decided the valley should become a national park service (NPS) site. They met resistance by the NPS, who didn’t want to defer funds from the western parks such as Yellowstone. A failed bill in 1971 proved Congress needed to see strong public support before such a bill would pass. In 1972, a precedent was set by the NPS when urban national recreation areas were established under Nixon’s “Parks to the People” in New York City and San Francisco. Congressman Regula continued to champion the park guiding more than $200 million in funds to it to purchase land, restore nearly 100 historic structures, and establish activities. This rehabilitation started in the mid 1980's. In 2000, Congressman Regula successfully led the park’s name change to Cuyahoga Valley National Park. An example of reclamation is the former Krejci Dump Site which was loaded with leaking barrels due to industrial waste. The clean up crew worked 20 years to restore the site. Now plants and flowers grow in wetlands once poisoned by toxic waste. In the 1960s, the Cuyahoga River was so full of oil and toxic sludge that nothing could live in it. A railroad trestle in Cleveland, near the river’s mouth, caused debris such as floating logs and picnic benches to pile up. In 1969, a spark from a passing train fell into the river’s oil and debris and set it on fire. It was a wake up call igniting the national environmental movement. The Clean Water Act of 1972, Earth Day, and the creation of state and federal EPA agencies resulted from this incident. Few people realize the river had caught on fire nine other times and as early as 1868. 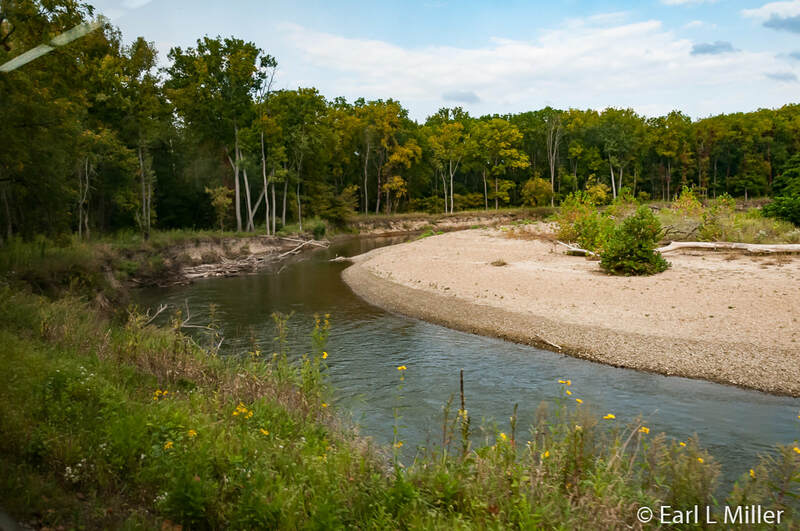 The Cuyahoga River is making a comeback. Industries and cities are pouring far fewer toxins into it. The most polluted area, between Akron and Cleveland meets some if not all of the Clean Water Act standards. 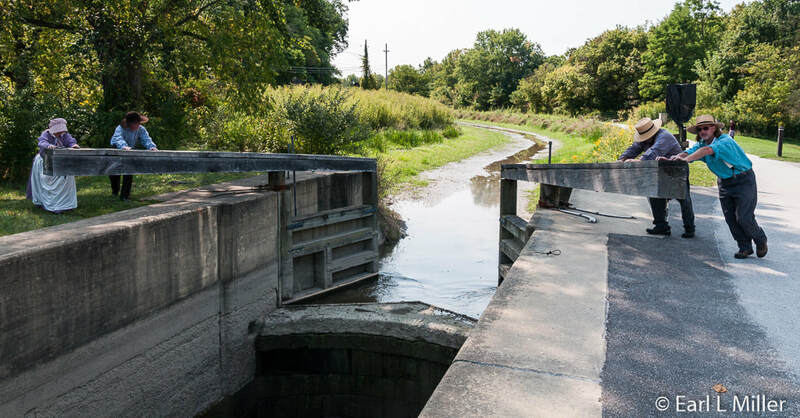 Yet even today, sewer overflows exist, runoff comes from fields and parking lots, and sediment continues to impair the river’s water quality. Since the early 1800's, farming has been prominent in the Cuyahoga Valley. 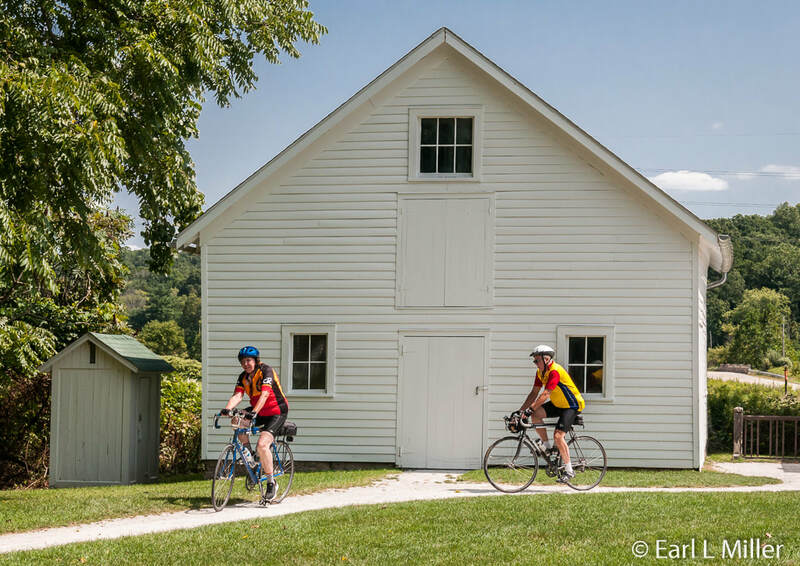 The Cuyahoga Valley Countryside Conservancy, established in 1999 as a nonprofit cooperating partner of the National Park Service, has focused primarily on the Countryside Initiative farm rehabilitation program. The first pilot farms were developed in 2002. Currently, ten farms are operational under this plan doing sustainable farming. This includes diversified crop selection, crop and livestock rotation, and the minimal use of pesticides. The vision is to develop 15 to 20 farms eventually using 1,350 acres or about five percent of park lands. The NPS owns the farms while the Conservancy provides the expertise in sustainable agriculture assisting the park staff and the farmers. The NPS grants long-term leases of farmsteads and fields to those who demonstrate that they practice sustainable farming. The park agreement requires selected farmers to offer recreational and educational opportunities to visitors. The park hand out “Rethinking Farming” lists complete information on all farms involved. 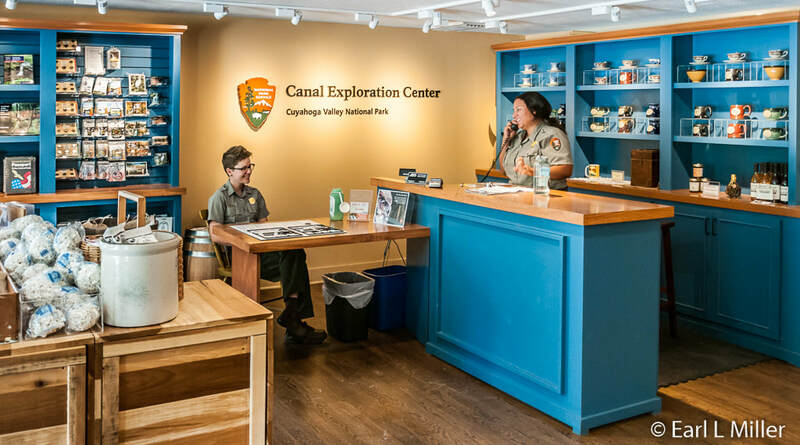 The Boston Store Visitor Center concentrates on the Ohio & Erie Canal. It crossed 330 miles between Cleveland and Portsmouth, Ohio and was built between 1825 and 1832. When the railroads moved in during the 1850's, their speed and their ability to run year round made the canals obsolete. Boats still ran until the Great Flood in 1913 destroyed the canal. The Kelley brothers built the Boston store around 1836. It later served as a post office and a private residence before becoming a visitor center. It is located at 1550 Boston Mills Road in Peninsula. This is the only visitor center open year round. It has the biggest bookstore and is a great place to obtain information and ask rangers questions. Go upstairs after requesting to watch the 15-minute movie “Generations” relating park and canal history. Then check out the historic photos lining the theater’s walls. At one time, the second floor's 13 rooms were used as boarding spaces for area workers. You can see downstairs the remains of a canal boat discovered in the 1930's in Akron. 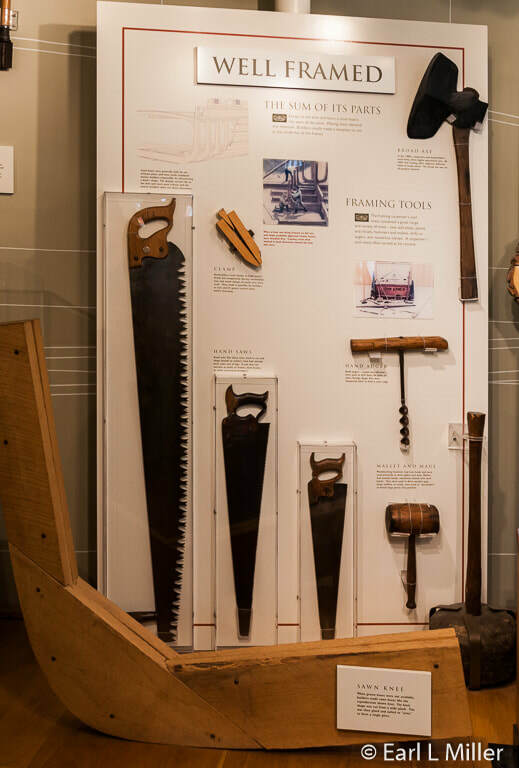 Displays cover in detail how canal boats were built including the types of tools and the different kinds of wood used. Boston and Peninsula were both boat-building centers. 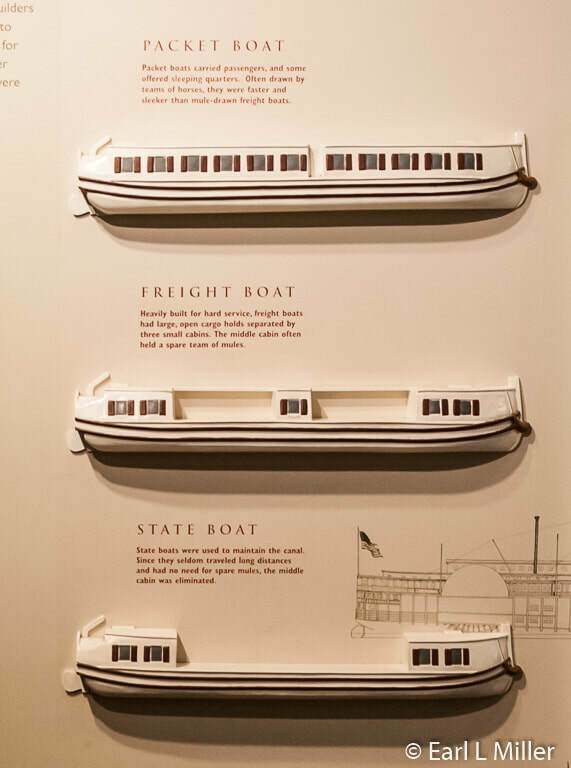 One display describes the four types of canal boats used. These were the line boat, passenger packets, freight boats, and state boats. The line boat was the earliest type seen on the Ohio & Erie Canal. It carried passengers and up to 50 tons of freight. Passenger boats could accommodate up to 40 passengers with little privacy for sleeping, eating, and personal hygiene. Freight boats, which appeared in the 1840's, carried up to 80 tons of freight. State boats were used to maintain the canals. A new visitor center has been designed with a planned opening in 2019. It includes a main building with exhibits. Two smaller structures nearby will serve as restrooms and storage space. Each will reflect the historic feel of the village of Boston. Visitors will find an outdoor pavilion and courtyard supplying them with park information. Indoor displays will provide park orientation on its history, geography, natural resources, and the surrounding areas. Moses and Polly Gleason purchased what is now the Canal Exploration Center in 1837 hoping to take advantage of the canal traffic. They used it as a store and tavern for passengers who shopped while their boats went through Lock 38. In 1852, their son, Isaac Gleason, expanded the building to resemble its current facade. Later, it was a private residence, boardinghouse, and blacksmith shop. At the Center, on weekends from Memorial Day through the end of October from 11:30 a.m. to 2:30 p.m., rangers demonstrate the locks. 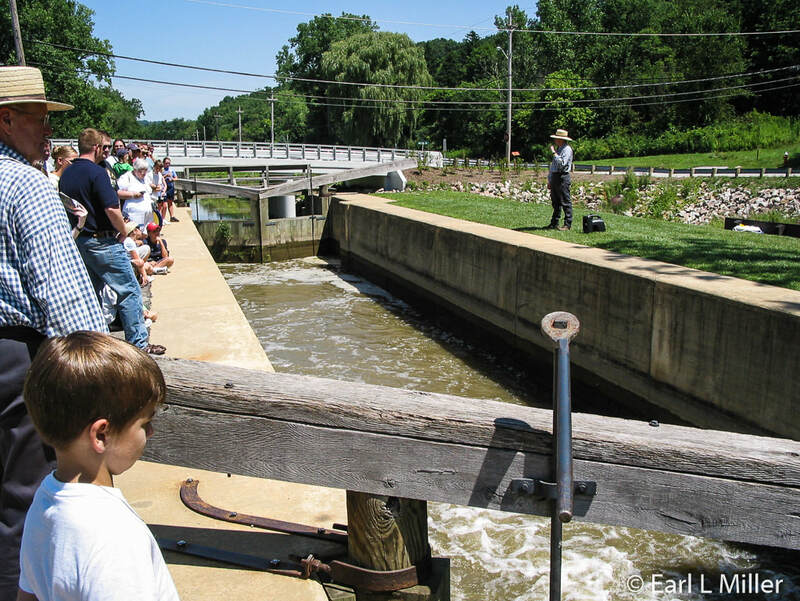 You’ll find the Canal Exploration Center at 7104 Canal Road in Valley View, Ohio. Hours are seasonal. Inside, visitors see two floors of exhibits. 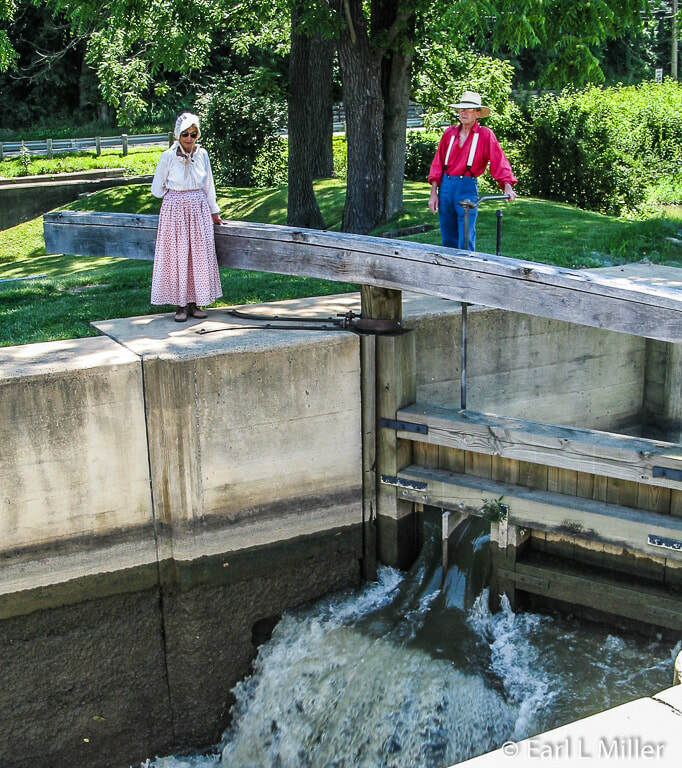 They can read a time line on canal history, learn about the nation’s canal system, find out who worked on the canal and the difficulties they encountered, and discover why a canal system was necessary. At one interactive, they can meet a passenger, tavern owner and boat captain. By picking up telephones, hear from John Malvin, an African American canal boat captain. Touch screens allow visitors to navigate a boat through a lock. One exhibit debates whether building the canal was worth it. It launched commercial development creating more jobs. News came faster. It made it less costly and easier to ship agricultural products to Eastern markets and buy more store bought goods. Yet the canal was expensive and relied on tax revenues. In addition, the state of Ohio took over private lands. 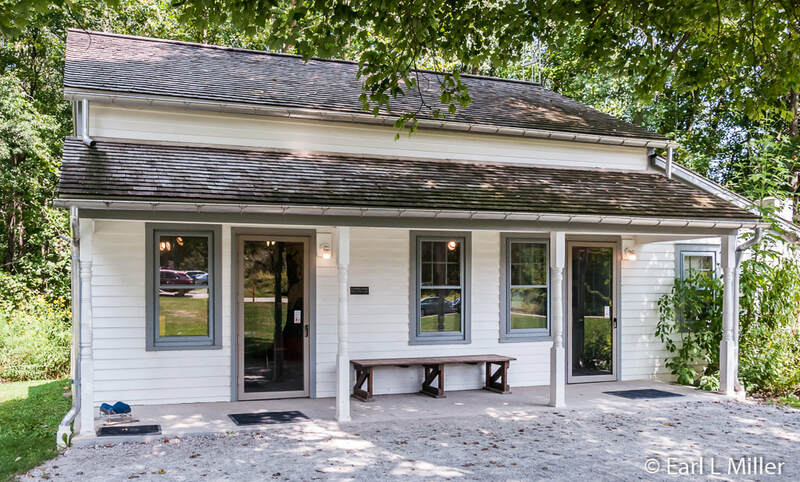 A small visitor center, the Hunt House, at 2054 Bolanz Road in Peninsula, is dedicated to displays on exotic and native species of plants and animals. This center has one room designed for children’s activities such as coloring and puzzles. Center hours are seasonal and parking in the summer can be difficult to find unless you come early or late. The original farmhouse was owned by the Hunt family from 1867 to 1880 and no longer exists on the property. The current house was constructed around 1880. The Hunts produced winter wheat, Indian corn, and oats. Nelle and William Fiedler moved onto the farm where he was involved with truck farming. They raised their family on this farmstead. The larger barn to the center’s east was once the one room Boezum School used from 1921 to 1931. It was torn down at its original site and reassembled by Fiedler. He used it for a horse and a few cows. Today it is utilized by the park for storage and maintenance. Another Peninsula stop is the Everett Covered Bridge at 2370 Everett Road. 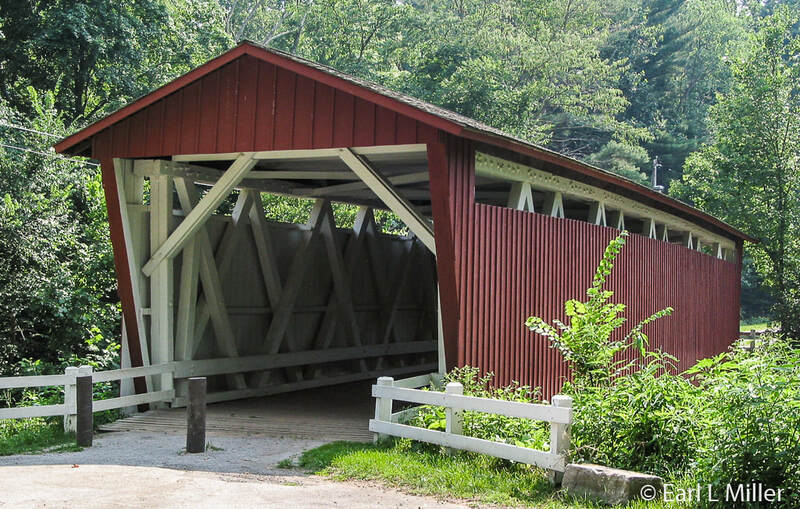 It crosses over Furnace Run and is the only remaining covered bridge in Summit County. During the 1800's, it was one of more than 2,000 in Ohio. This is not the original. It was first built in 1877 after a local resident was killed attempting to cross a swollen Furnace Run, It was destroyed by the Great Flood of 1913 and then by a spring storm in 1975. The NPS reconstructed it in 1986. It’s closed to vehicular traffic. 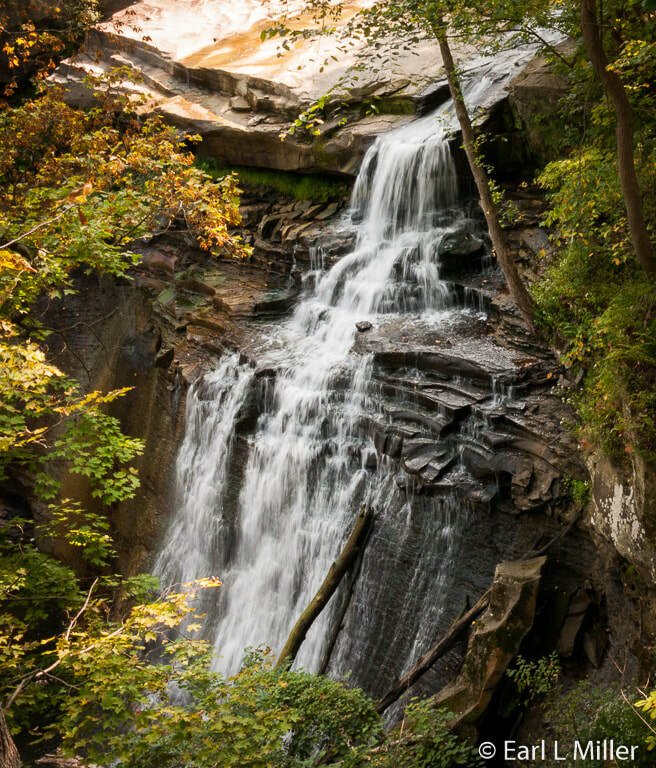 The major waterfall in the park is the 60-foot Brandywine Falls carved by Brandywine Creek. Situated at 8176 Brandywine Road in Sagamore Hills, it’s the second highest falls in Ohio. After following a boardwalk, you have your choice of two viewing areas - one at the top and one at the bottom. It’s a long way down via steps to reach the bottom. Note the parking lot is usually full between 10:00 a.m. and 2:00 p.m. 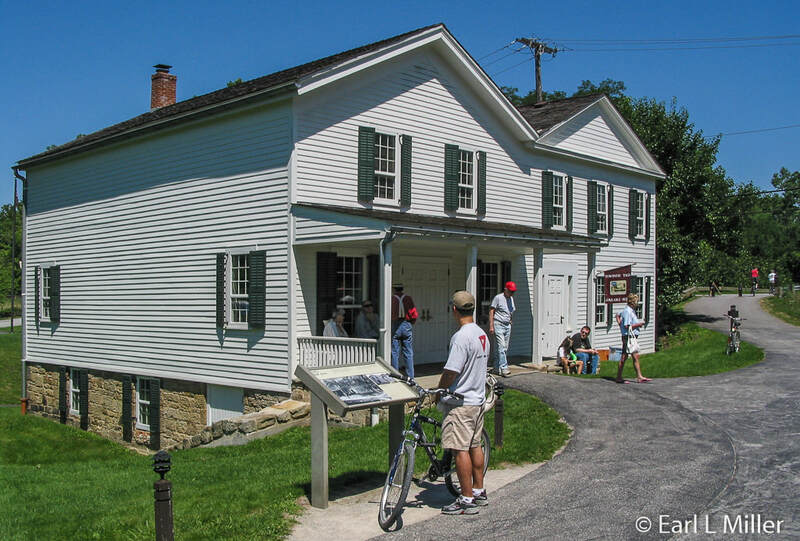 In 1814, George Wallace founded Brandywine Village and built a sawmill. During the next decade, others added a whiskey distillery, grist and woolen mills, and 12 homes. The village thrived for 30 years. Eventually Brandywine’s prosperity dried up due to the coming of the railroad and the town having no direct access to the canal. The village found new life and industry during the 1920s when Champion Electric Company was built amongst the ruins of Wallace’s gristmill. The company manufactured restaurant appliances until 1937 when lightning destroyed the factory. The village’s remains are the James Wallace house, built by George’s son in 1848, and Wallace’s barn. 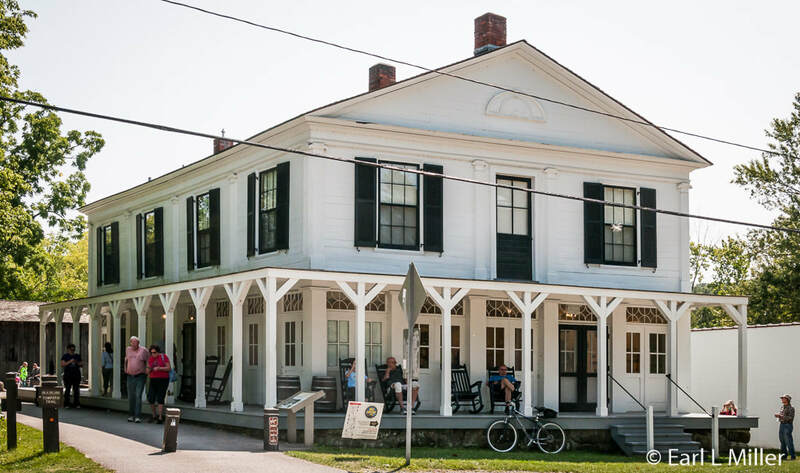 They now comprise the Inn at Brandywine, a six-room bed and breakfast in the park. You can also hike to the gristmill ruins. For more places to view and an excellent map, pick up the park handout “Popular Park Attractions” at one of the visitor centers. Thirty-nine mammal species have been identified in the park with small mammals making up the majority. Since much of the park is covered with fields and forests, mice, moles, chipmunks, rabbits, voles, and squirrels are common. Coyotes have recently returned after a long absence. Recent surveys estimate between 100 and 150. Red and grey foxes have been found though grey foxes are quite rare. Seven species of bats have been identified. At night, you might spot a raccoon or opossum. Another example of rehabilitation is the 70-acre Beaver Marsh at 3801 Riverview Road which has become one of the best spots in the park for wildlife. Visitors can stroll through the marshland on a boardwalk. Up until the early 1980's, it was the home of an auto repair shop surrounded by a salvage yard filled with rusty cars and worn-out parts. In 1984, the Portage Trail Group of the Sierra Club organized a site clean up. They removed 113 cars. Beavers started to move in when the salvage yard was gone. They had been absent from the park for almost a century. They made it into a wetland where plants returned and wildlife such as green frogs, turtles, otters, bats, and muskrats make their home. It’s also a particularly good place for bird watchers to visit during waterfowl migrations in March and November. About 250 bird species have been identified in the park because of its diversified landscapes. Great blue herons nest in treetop colonies caller heronries. Herons are easy to spot since they are four feet tall and have seven foot wingspans. It’s interesting to watch their twig offerings. Males present twigs to females. If these are accepted, the twigs are used to repair or build the nests. They remain monogamous within a single breeding season but choose new mates each year. One place to see them, from February through July, is from a pullout along Bath Road at the Bath Road Heronry. Another is the Pinery Narrows Heronry in the early spring. This can be done by following the Towpath Trail north for a half mile from the Station Road Bridge. Look for a small clearing just before the Bridle Trail junction then look across the river for the heronry. In 2006, a pair of adult bald eagles nested in this heronry successfully raising an eaglet. It was the first to be born in Cuyahoga County (Cleveland area) in more than 70 years. Another site to see birds is where the Richfield Coliseum, former home of the Cleveland Cavaliers, was torn down. Today it’s a field. It’s known to attract five species during breeding season. These are the Eastern meadowlark, bobolink, Savannah sparrow, Grasshopper sparrow, and Henslow’s sparrow. Since the birds nest on the ground, visitors are required to stay on the grasslands’ edge from April to August. This is because disturbance of the nests could result in their failure. Due to migration, it’s also possible to see various hawks, shore birds, and short-eared owls. The field is located on the north side of State Route 303, just west of the intersection of I-271. The park does not stock fish for recreational fishing and encourages catch-and-release. CVNP has more than 65 fish species which include bluegill, bass, and crappie. There are fourteen regulations listed in the handout “Fishing Makes Memories.” One is an Ohio fishing license is required to fish in the river, lakes, and ponds. Another states fishing can only be done by hook and line with the rod or line closely attended. Boats with motors are not allowed on the ponds. 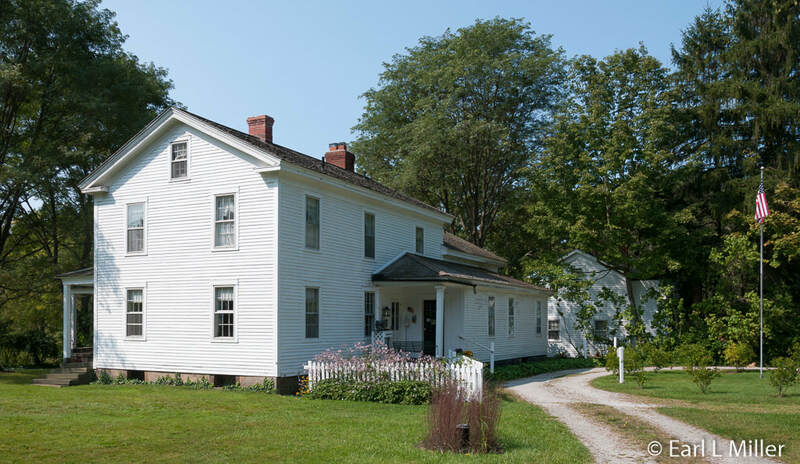 Hale Farm & Village, owned by the Western Reserve Historical Society, is a terrific place to visit for living history. It’s a recreated village centered around the 1826 brick home of Jonathan Hale, one of the area’s earliest settlers. You’ll find historic buildings which have been brought in throughout the region. Through first person interpretation, craftsmen demonstrate their skills. This includes a potter, blacksmith, spinner, weaver, candlemaker, broom maker, and glassblower. They are open Wednesday through Sunday from June through August and for special events at other times. Located at 2686 Oak Hill Road in Bath, Ohio, their phone number is (330) 666-3711. The Blossom Music Center is the summer home of the Cleveland Orchestra. They offer programs ranging from classical to pops. The Center also has numerous other seasonal events. Their amphitheater seats 5,000 and their lawn another 13,500. To find out more, call (330) 920-8040 or visit their web site. Their address is 1145 West Steels Corners Road, Cuyahoga Falls, Ohio. Another theater in the park is the Porthouse Theater which is run by Kent State University. Summer stock varies from Shakespeare to Broadway musicals, opera, and drama. For more information and tickets, call (330) 672-3884 or visit their web site. The Park has 125 miles of hiking trails. The major one is the Ohio & Erie Canal Towpath Trail with 10 trailheads allowing for parking and access. It follows the Ohio & Erie Canal route through the Cuyahoga River Valley. Level and hard packed, it is fully accessible. The trail is ideal for biking, hiking, and jogging. You’ll find picnic areas, restrooms, and train access points along the way. It runs from Rockside Road in Independence, Ohio through the park to Akron and beyond. Golfers find four public golf courses in the park. They are Amherst Country Club in Walton Hills, Brandywine Golf Course in Peninsula, Shawnee Hills Golf Course in Bedford, and Sleepy Hollow Golf Course in Brecksville. The park web site has more information on these under Plan Your Visit/Golfing. Skiing is big at the park during the winter with the slopes at Brandywine and Boston Mills being popular. Highlights are the 16 lifts, grooming and complete snow making coverage on all slopes, ski and snowboard rentals, instruction, and night skiing. Visit their web site for more information. You will find the Winter Sports Center at M.D. Garage this winter. It's located next to the Boston Visitor Center. Snowshoes and cross country skis can be rented on weekends here when there are at least six inches of snow. The Center involves hiking, cross-country skiing, snow tubing, snowshoeing, sledding, and ice fishing. Hours of operation vary. 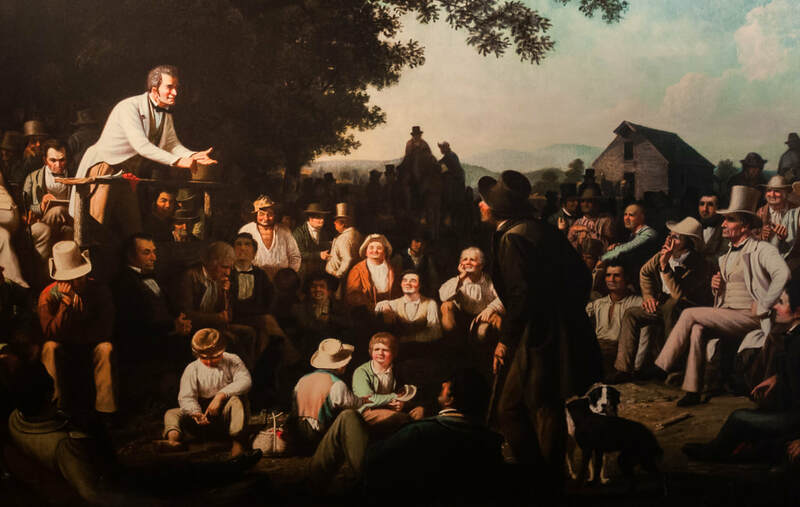 Cuyahoga Valley Institute’s Lyceum series presents experts in various topics. Seating is general. Admission is $6 for adults and $3 for children ages 3-12. All lectures are held at Happy Days Lodge with doors opening at 6:00 p.m. and the program starting at 7:00 p.m. The series runs January through May with details posted on the park’s web site. Happy Days also holds concerts with ticket prices varying according to the performance. The schedule and ticket information is on the park’s web site under Music and Art in the Valley then Concert Series. Advance sales are available at (330) 657-2909. M.D. 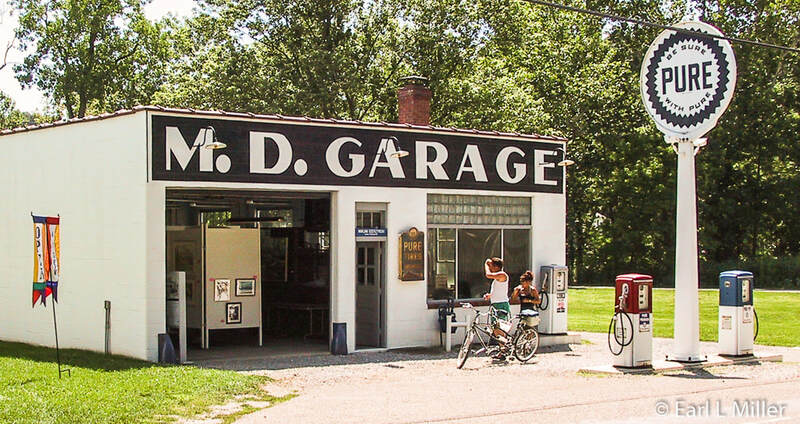 Garage was once a hub of activity in the historic village of Boston along the Ohio & Erie Canal. Closed in the 1980s, the 1946 Pure Oil Station was purchased by the National Park Service and restored in the late 1990s. The facility offers a unique open space for art exhibits and special events. Exhibit hours are 10 a.m. to 4 p.m. every weekend from May through October in 2018. Admission is free. It is located at 1556 West Boston Mills Road in Peninsula. For more information, go to their web site. Some kind of event happens frequently in the park. Pick up their seasonal schedules at one of the visitor centers and see what interests you. The Valley Railway began service in 1880. 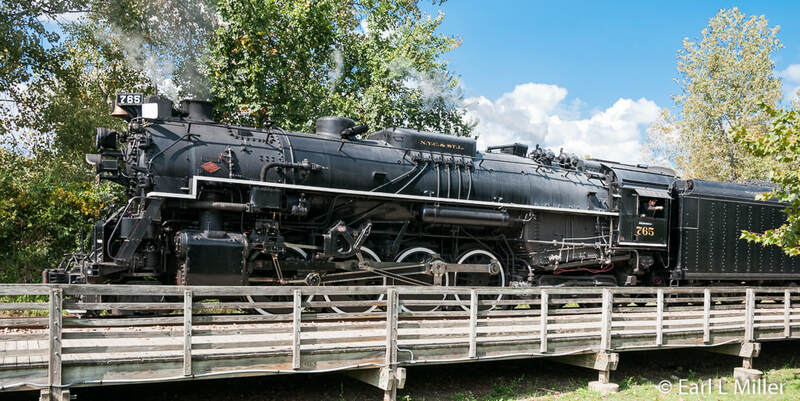 It was built to carry coal between the Tuscarawas River Valley and Cleveland but also served farmers, merchants, and factories along its route. Financial difficulties in 1894 led to its acquisition by the Cleveland Terminal & Valley Railroad (CT&V). In 1915, the Baltimore and Ohio Railroad bought the line and continued providing freight and passenger service. As of 1963, the line only carried freight due to the automobile causing a decline in passenger traffic. Interest in the line was renewed in 1972 and the Cuyahoga Valley Line (CVL) began operation of a tourist train through the park in 1975. The Chessie System owned the track and ran freight at night until 1985 leasing the track to the CVL during the day. 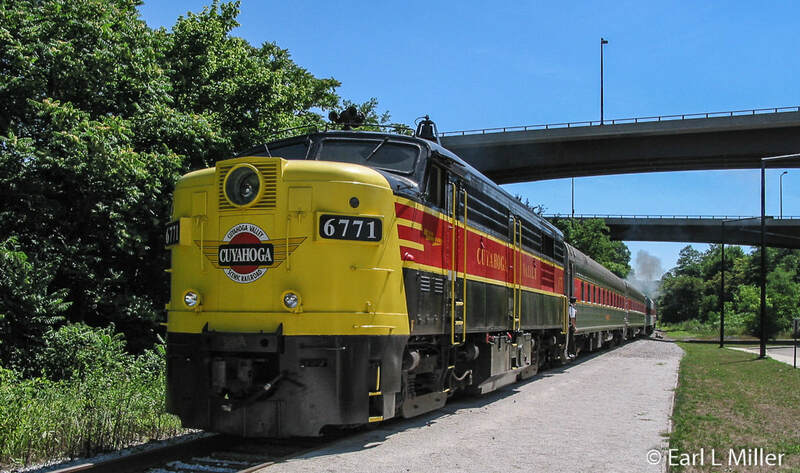 The Cuyahoga Valley Line reorganized as the Cuyahoga Valley Scenic Railroad in 1994 and now owns, maintains, and operates the rolling stock. Since 1987, the NPS has owned and maintained the train track. 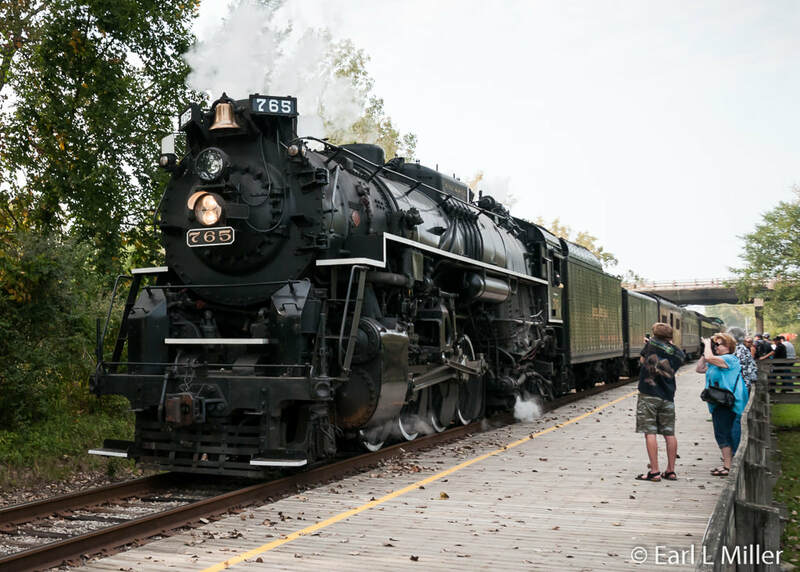 The Cuyahoga Valley Scenic Railroad operates year round between Independence and Akron along the Cuyahoga River paralleling the canal towpath. What you see primarily is a deciduous forest. I would not call it a scenic ride, compared to the ones we have gone on in Colorado, with the exception of fall color trains when the railroad sells out fast. However, it is a relaxing 3-1/2 hour ride and is very reasonable in cost. The ticket on the National Park Scenic train trip serves as an all day pass. Adult coach is $15, first class $23, and dome tickets $28. Children, ages 3-12 are coach $10, first class, $18, and dome tickets $23. On top of these charges, a $1 preservation fee and $.25 for processing are added. First class and dome seats are assigned while coach is not. For January 2018, an executive seating option on the St. Lucie Lounge car has been added. The ticket includes a sandwich and a non-alcoholic beverage. Fare is $35 per person plus the $1.25 in fees for ages three years and older. Children under age three can ride on their parents’ laps for free. Seniors, ages 55 and older, receive a $2 discount off but only on adult coach tickets on weekdays. 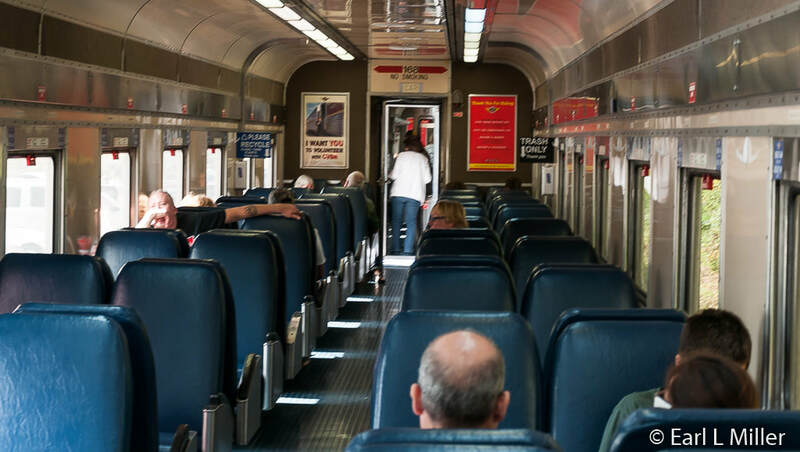 Active military, veterans, and first responders receive free coach tickets on any regularly scheduled train. Up to three of their family members or guests may receive half price tickets. ID must be shown. Since coach seating is not assigned, it’s relatively easy to get off one train and hop on another since the train travels in loops all day. Passengers may get off of the first class and dome cars. However, seats are not guaranteed upon reboarding. Boarding is at three stations. Akron Northside is at 27 Ridge Street. The Peninsula Depot is in the heart of Peninsula and Rockside Station is at 700 Old Rockside Road in Independence, Ohio. One coach car has a lift so it is handicapped accessible. The Peninsula Depot was originally located in the village of Boston and moved to its current site in the late 1960s. It may be the only surviving station from the Valley Railway. Besides being a station for the railroad, it’s also one of the park’s information centers. You’ll pass Jaite. It was at one time a company town dominated by the Jaite Paper Mill. It had homes, a general store, a post office, and a railroad station. The mill made four types of sacks: flour, fertilizer, bread, and cement. In its prime, during the 1920's and 1930's, Jaite was the 11th largest multi wallpaper producer in the nation. The company was sold to Owens-Illinois and later to Tecumseh. The mill closed in 1984 and was purchased by the park the next year. Due to safety hazards such as exposed asbestos and unsecured walls and roofs, the industrial buildings were torn down. Six of the former residences and the former general store now comprise the park headquarters. You also pass by the eagle’s nest and the Beaver Marsh. In Akron, you’ll pass a statue of a Native American carrying a canoe. It was done by sculptor Peter Jones, a Seneca-Onondaga artist. It marks Portage Path where Native Americans portaged their canoes from the Cuyahoga River to the Tuscarawas River. According to the 1785 Treaty of Fort McIntosh, the Portage Path was the boundary line between land legally open to European settlement and that which belonged to the native people. The train ride is not narrated but a free app is available at the Apple Store or Google Play called CVSR Train Tracker. I advise everyone who is taking this train ride to get it. At many points along the route, audio comes on providing stories and information about the park and the valley which will add enjoyment to your ride. It also gives the speed, direction, and location of the train. You don’t have to be on the train to listen to the audio as long as the train is running. Another option is to ask the train attendant for a headset to use onboard the train. The Bike Aboard program deserves a lot of praise. It makes it possible to ride your bike along the Ohio & Erie Canal Towpath Trail in one direction and return on the train in the other. The train schedule and map are posted at train stations. The train can be flagged down at any of these stations by waving both arms above your head. It’s suggested you plan to arrive 10 minutes before departure time. You pay $3 for ages three and up, with no extra charge for your bike, upon boarding. Exact change is appreciated. For runners and hikers it’s $3 per person ages three and up. You may travel north or south once in a day. Seats aren’t guaranteed. The Grape Escape allows you to sample five wines while on board and learn about their characteristics. Chef prepared hors d’oeuvres are provided. Tickets start at $60 plus $1.25 in fees. The next two events are Reislings on January 27 and Bubblies on February 24. Both are from 7:30-9:30 p.m. and depart from the Rockside Station. You must be at least age 21 to participate. Ales on Rails provides for a sample of five craft brews and hors d’oeuvres. You’ll learn about the beers’ characteristics. The next two events are Best Brews on January 20 and Anderson Valley on February 17. These also are from 7:30-9:30 p.m. departing from Rockside Station. You must be age 21 to participate. Cost starts at $50 plus $1.25 more for preservation and delivery fees. 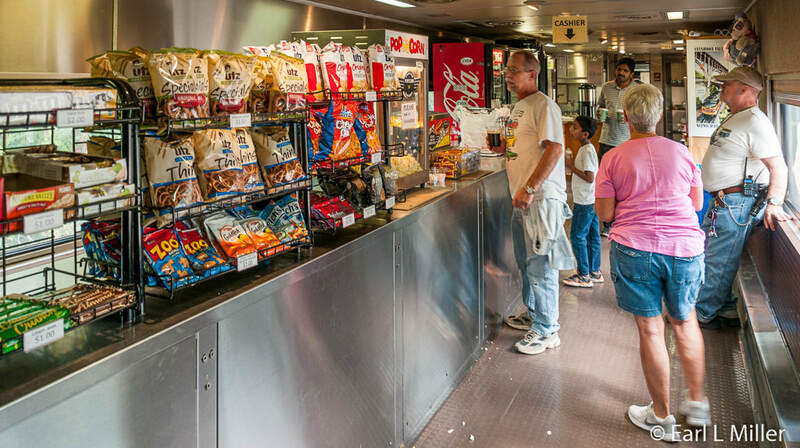 CVSR offers regular dining excursions and trips to Hale Farm & Village. Excursions include murder mysteries, trivia night, Haunted Cuyahoga: Ghost Stories of the Valley, and many other special events throughout the year. They also run several Polar Express trains. All of these sell out quickly. Each year, the railroad works with the Fort Wayne Historical Society in Fort Wayne, Indiana to bring historic steam locomotive No. 765 to the Cuyahoga Valley. In 2017, it occurred September 16 and September 23. It’s a two-hour trip where passengers can hop off the train to take photos. The place is kept secret to prevent congestion. The steam train ticket fare ranges from $25 to $50. To learn more about the railroad or to buy tickets go to their web site.